Mister Mellow is Ernest Greene’s first album in seven years. Though Greene has kept his moniker Washed Out, a break from his previous label Sub Pop marks a momentous change in musical direction as Greene has signed on to the hip-hop label Stones Throw Records. The label, once only signing hip-hop acts, boasts a diverse range of music. 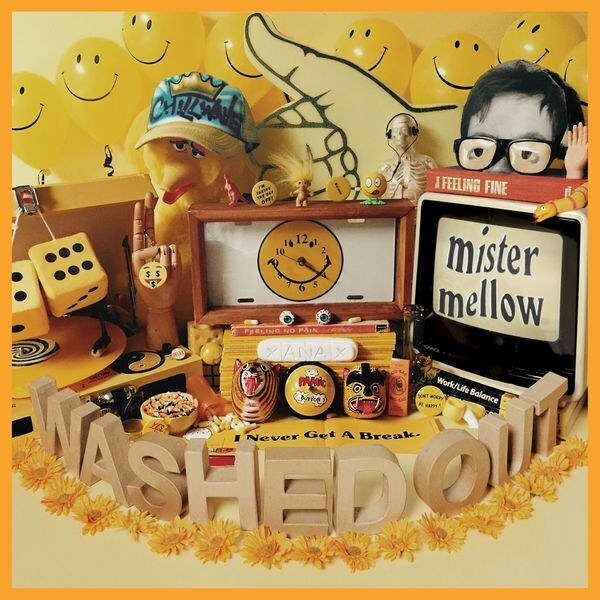 This change in production is reflected throughout Mister Mellow; as Washed Out’s classic “chillwave” sound is heavily layered with samples and infectious lo-fi beats. From the first sound, Mister Mellow is startlingly different than his previous albums. The intro “Title Card” is wonderfully orchestral and dramatic, yet there is a feeling of dystopia deeply resonating in its thirty seconds. This dystopia is quickly subdued under the hazy drug spell “Burn Out Blues”, the second track that seems to function as the beginning of a deeply personal yet relatable explanation for the album, where Greene sings about needing time: “To slow down/relax and clear my head/just unwind/so I can breathe again”. His explanation is almost a plea: for in “Time Off”, the first words that are spoken amongst the psychedelic chords and dreamy momentum are “forgive me”. Whether the voice speaking is a sample or Greene’s own voice trippily distorted, the effect is stark and emotional. As the voice deepens in pitch, it reflects the monotony of daily, capitalist-driven American life: “Monday, Tuesday, Wednesday” the voice drones on the fourth track “Floating By”. Greene’s goal here is to forget all that is bringing him down, and he dramatically catapults the listener into a soundscape of bright meadows overflowing with daisies and manic, uncontrollable laughter. It is a drug-induced happiness, foreshadowed by the Xanax pill that is front and center on the album cover. As the chemicals take over, a dreamy haze permeates the brain and the ensuing track “I’ve Been Daydreaming My Entire Life” feels soothingly content, a gorgeous and shimmering track with traces of Bonobo influence that add effortless ambience. Drifting from effortless ambience, Greene combines classic bossa-nova grooves with bouncy house synths and hi-hat hits in “Hard To Say Goodbye”. In a single song, Greene welcomes us into a dance party in a busy city square, then scampers down the subway stairs, leading us into the dark and dusty nostalgia of the train station. This is suddenly the darkest, most eerie part of Mister Mellow. A blunt juxtaposition from the sunny dance vibes, the consequent track “Down and Out” is indeed exactly what the title suggests: gritty and brooding, a dark mood that doesn’t seem to have an timely end. The darkest parts of the human psyche are almost like a time warp. Our moods that become saturated with melancholy or anger seem to last forever, but when the emotions have torn their way through our minds and bodies they instantly vanish, almost as if they were never there. This is the mysterious yet necessary “ups-and-downs”, the often dramatic roller coaster of life. What Washed Out does in the tracks “Down And Out” and “Instant Calm” is provide a brief, but very emotional soundtrack to this roller coaster. He earnestly explains that “music is a big part in keeping me happy…and keeping me sane”, rolling right into “Instant Calm”, almost as if the press of the button and the start of a song is enough to quell the negative emotions consuming our minds. And for a moment, it is. One song is enough to change your entire mood, your whole perspective on what it means to live, what it means to endure each passing day. “Instant Calm” allows for deep reflection, the interlude between emotions. When at once you are contemplating life and all its meanings, Greene throws you right back into the super groovy, psychedelic atmosphere. Tracks like “Zonked” and “Get Lost” are carefree and ambitiously joyful. It is a reminder that those emotion still exist, after the tremendous amount of weight we have carried on our shoulders. “Easy Does It” seems to be the aftermath of the evening, the early morning of trash-strewn streets and mellow conversations over cups of coffee. This early morning leads us into the bright new day with “Million Miles Away”, a slow and contemplative track of wonder, a questioning of the future. And with that, Mister Mellow ends dreamily, like a balloon drifting up into the sky. Listen to the full album on Spotify, or order the album through Stones Throw.